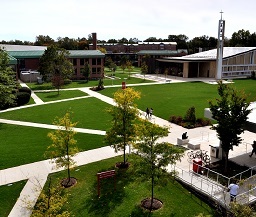 Sacred Heart University, the second-largest independent Catholic university in New England, offers more than 70 undergraduate, graduate, doctoral and certificate programs on its main campus in Fairfield, Conn., and satellites in Connecticut, Luxembourg and Ireland. 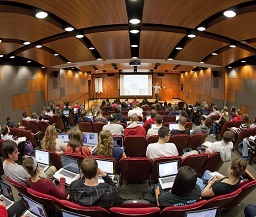 More than 8,500 students attend the University's five colleges: Arts & Sciences; Health Professions; Nursing; the Jack Welch College of Business; and the Isabelle Farrington College of Education. 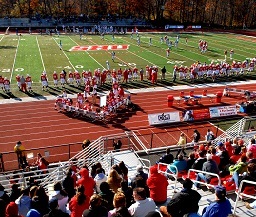 Distinguished by the personal attention it provides its students, Sacred Heart University (SHU) is recognized for its commitment to academic excellence, award-winning advisement program, cutting-edge technology, championship Division I athletic teams, and nationally recognized community service programs. 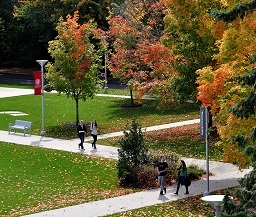 Situated in Fairfield, Connecticut, the main campus is ideally located one hour north of New York City and 2.5 hours south of Boston in proximity to world-class hospitals, nationally ranked elementary and secondary schools, a high concentration of Fortune 500 corporations and access to the employers in Connecticut's creative corridor. 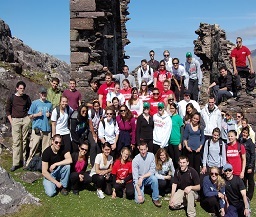 SHU also has international campuses in Dingle, Ireland and the European business center of Luxembourg, a partner campus in Rome, and study abroad options worldwide. Students may spend their freshman fall semester abroad program or participate in short-term and semester programs throughout their four years. 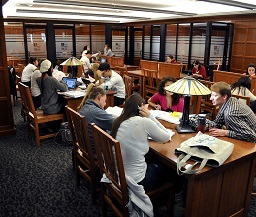 Within the AACSB-accredited Jack Welch College of Business, College of Arts and Sciences, College of Health Professions, College of Nursing, Isabelle Farrington College of Education, School of Computing and School of Communication and Media Arts, students in all majors engage in hands-on education both in and outside of the classroom. Cutting-edge technology in the Frank and Marisa Martire Business & Communications Center allows students to apply their skills in real world settings such as the Finance Lab & Trading Floor, full-size television studios and a motion capture lab. The new Center for Healthcare Education features the latest technology available to health professions students. Students in the sciences utilize recently renovated laboratories and state-of-the-art computer labs. A hallmark of a SHU education is the strong connection between students and faculty beginning in the freshman year. 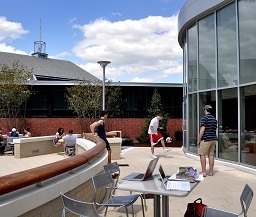 Faculty connect with students in interactive, innovative spaces in our academic buildings; through online communities such as SHUSquare for freshmen; in joint research projects; in advising sessions and through many academic clubs, organizations and activities. Faculty lead students on study trips across the globe and on excursions to locations such as Washington, D.C. for political science students and the New York Stock Exchange for finance students. The University's commitment to experiential learning incorporates concrete, real-life study for students in all majors including research, internships, clinical placements, independent study, service learning and work-study. Drawing on the rich resources in New England and New York City, students are connected with research and internship opportunities ranging from full-time internships at sought-after sites such as Madison Square Garden to research with faculty on marine life in the Long Island Sound. These opportunities help pave the way for a 95 percent placement rate for graduating seniors in full-time jobs and graduate study. 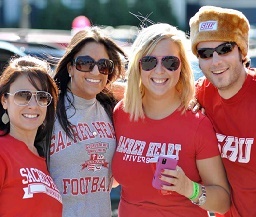 SHU's experiential learning opportunities are complemented by a rich student life program offering more than 160 student organizations, including Greek life; leadership programs, media organizations such as the TV station, radio station and newspaper; academic clubs and multicultural organizations. 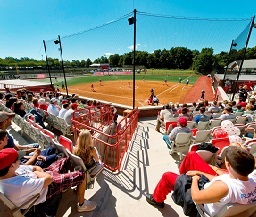 The University has a well-respected Division I athletic program and a robust club sports program with more than 1,500 athletes who compete in 32 varsity sports and 27 competitive club sports teams. 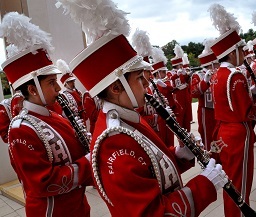 The University's strong performing arts program, led by a Tony-and-Grammy-nominated producer, includes the theatre arts program (also available as an academic major), a choir program with various ensembles, an instrumental music program including marching band, pep band and concert band among other ensembles and a dance program with a variety of ensembles. The campus has a lively atmosphere with over 90 percent of freshmen living on campus and many school spirit, cultural and social events offered throughout the year. Students heap praise on this small Catholic university located in Fairfield, Connecticut, a place where "academics meet real-world experiences." Sacred Heart University is a Catholic school, but students underscore that "we do not force religious teachings upon the student body; rather, we offer a helping hand in times of despair as well as times of fortune." One of Sacred Heart's points of pride is being known as a "door-holding" school: "We all hold doors for each other, help each other out, and look out for one another." With an undergraduate population of a little less than 5,500, students say, "The student body is one of the most tight-knit groups of people [they] have ever been a part of." The school's proximity to New York City, Hartford, and Stamford provide opportunities for real-world experiences outside the classroom, and students say the "internship and job opportunities we have here are unique and amazing." Specific programs of note for students include the "business, nursing, and health professions programs," with one student declaring that the choice to attend SHU was down to the school's "fantastic nursing program." Professors are "enthusiastic, encouraging, and helpful" on the whole, and students appreciate that some "also allow students to engage with their research which then will allow kids to get published." Beyond the coursework, one student says that professors at Sacred Heart have "opened my eyes to how the world works." The University comprises five distinct colleges and two schools: College of Arts & Sciences; School of Communication & Media Arts; School of Computing; College of Health Professions; College of Nursing; Isabelle Farrington College of Education; and the AACSB-accredited Jack Welch College of Business, committed to educating students in the leadership tradition and legacy of Jack Welch. The University offers more than 70 undergraduate, graduates, doctoral and certificate programs including online degree programs. Upon introducing the new undergraduate Core Curriculum in Fall 2007, the University was invited to become a member of the Association of American Colleges & Universities (AAC&U) Core Commitments Leadership Consortium, which includes just 23 institutions nationally. AAC&U has recognized SHU's Core Curriculum as a national model of values education. A newly revised core curriculum was launched in Fall 2015. At the undergraduate level, Sacred Heart University offers two baccalaureate degrees: Bachelor of Arts or Bachelor of Science depending upon the nature of the discipline of the major. SHU also offers Associate in Arts and Associate in Science degrees. A central component of undergraduate study is the University's Core Curriculum, the Human Journey, which embodies the University's commitment to academic excellence, social responsibility, and ethical awareness. All candidates for the baccalaureate degree must complete at least 120 credits, with a minimum of 30 credits taken at Sacred Heart University. A minimum cumulative GPA 2.0 is required. Tuition for the 2017-18 school year is $39,570. Room and board is $14,770. 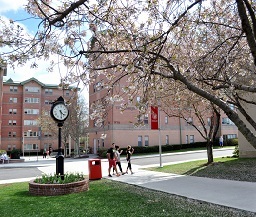 Sacred Heart University works with all students throughout the financial aid process. There are a wide variety of aid types SHU including need-based scholarships and grants, loans and student and University employment. The entire mood here is very upbeat, gushes one Sacred Heart student, and another adds that "door holding symbolizes us because we care about those around us and are very genuine people." When it comes to school spirit, Sacred Heart has it in spades. As one student puts it, "Sacred Heart University exemplifies school spirit and hospitality to every single student that walks [through] our campus." To sum it up, "The entire student body is one giant family." Much of the student body from the Tri-State area but students stress that Sacred Heart is "all about embracing diversity and cultivating a caring, safe, and academically prosperous environment." The school is a "tightly-knit community where people are excited to try new things and professors encourage students to branch out." 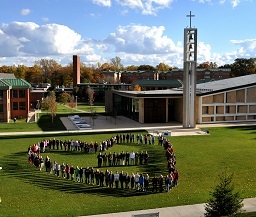 Sacred Heart University comprises more than 300 acres of land, including an 18-hole golf course and the former global headquarters of General Electric, now named West Campus. The main campus of the University sits on more than 100 acres in Fairfield, Conn. – located less than 60 miles from Manhattan and approximately 150 miles from Boston. The University-owned golf course is located in Milford/Orange, Conn. It is a signature Tommy Fazio-designed facility that has been ranked fourth-best in Connecticut by Golf.com. The recently acquired West Campus will be used as an innovation campus to expand the School of Computing and develop STEM field programs. Certain elements of the Jack Welch College of Business, including the new hospitality management program, the Isabelle Farrington College of Education, will be moved to the site. The Center for Healthcare Education houses the College of Health Professions and College of Nursing. The Center is designed to offer students with aspirations in any health-care profession the best possible learning environment to ensure that they are prepared to succeed in the booming health-care industry. SHU's newest dining hall, JP's Diner, is a '50s-style diner and the first on-campus diner in all of New England. Named for SHU President John J. Petillo, JP's is located on SHU's newly-constructed Upper Quad. Sacred Heart's newest residence Toussaint Hall is also part of the Upper Quad. The University maintains satellite campuses for graduate students in the Physician Assistant Program in Stamford, CT and for Graduate education students in Griswold, CT. The Edgerton Center for Performing Arts; Martire Business and Communications Center featuring an active trading floor with 30 work stations, 13 Bloomberg terminals, wallboard ticker tapes and real time data from NASDAQ and NYSE, screening venues, smart classrooms with multi-media technology, interactive labs, a motion capture lab, and two large television studios for TV, video and film production; The new Center for Healthcare Education containing an audiology suite, motion analysis and human performance labs, driving simulator, pediatrics clinic, medical gym, an immersive acute care simulation lab with video and data capture capability, a simulated outpatient suite, high-fidelity manikins, home-care suite, cadaver lab, and many more learning resources featuring the latest technology; School of Computing facilities including a Gaming Lab (which also supports the intercollegiate Gaming team), computing labs, a closed LAN laboratory, 3D printing lab and the motion lab; Fashion design studio; Art studios; Jandrisevits Learning Center includes spaces and technologies to provide academic support to students, including those with disabilities. SHU offers over 60 programs in 30 countries around the world, including two of our own global campuses in Ireland and Luxembourg. International experiences are available to SHU and visiting students—with study abroad programs that support a broad range of educational, professional, and personal goals. 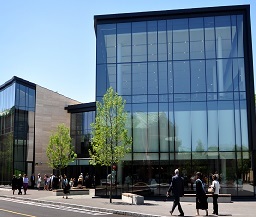 Looking at New England liberal arts colleges to study business? SHU has the only American-accredited MBA program in Luxembourg. Through service abroad, students learn about a new culture, generosity, and the value of servicing others. 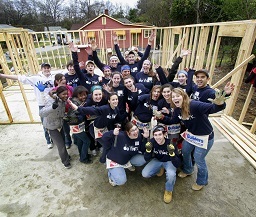 With our Office of Volunteer Programs and Service Learning, opportunities to volunteer abroad in Latin America and the Caribbean include helping to build homes, schools or medical facilities for those in need. SHU also offers undergraduate and graduate nursing and health professions students the opportunity to complete clinical service hours, capstone projects or service learning hours in Guatemala, Haiti, Jamaica, Uganda, India and the Cheyenne River Sioux Tribe Reservation in S. Dakota, as well as experience the local healthcare systems in each nation. It’s easy to keep busy at Sacred Heart, as “there’s always something happening on campus and on the weekends thanks to [the] Student Life department.” Students say that when their peers are not “studying or working, they are volunteering their time in the volunteer program.” Fairfield is “a great college town so there is a ton to do off campus,” and for those who want to venture a little farther, New York and Boston aren’t too far away. Greek life plays a role on campus but students seem to consider it just one more thing in a long list of potential things to do at Sacred Heart, rather than the only activity available. According to one student, “If you’re not the biggest partier, SHU is a great school for you.” One popular watering hole on campus is Red’s, “the oncampus pub,” where “senior students enjoy nightlife in town” and which also has “all-age nights where no alcohol is served and it is open to students of any class year.” When students want a break from campus, especially “when the weather is nice, students hang out at the beach, get some ice cream, and often are dining downtown.” As the school continues to expand—something students praise—parking is a growing issue that students hope the administration will address. JP's Diner - first on-campus diner in New England serves up typical diner fare to students - open late. Outtakes - a great spot for students to grab a quick snack or bite to eat. Serves Starbucks coffee. Red's - on campus pub open for students ages 21 and older. Center for Healthcare Education - state-of-the-art facility for nursing and health profession students. 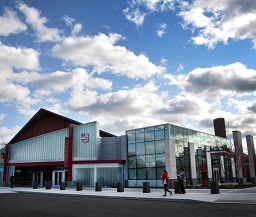 Bobby Valentine Recreation Center - fitness facility for the whole student population. Includes indoor track, a bowling center, an 18-bike spin center, a 45-foot climbing wall and exercise and weight-training rooms. The anticipated opening is August 2019. Day visits. Admitted students only. Shuttle buses, taxis, buses, MetroNorth, Amtrak; LaGauardia, JFK, Westchester, New Haven and Bradley Airports. Merritt Parkway (Route 15). Exit 47. Through roundabout, onto Park Avenue, campus entrance on the right.